Bar soap might just be one of the most misunderstood products out there. So many people ditched the bar for liquid soap, but hold on, don’t throw it out with the bathwater quite yet! Let me begin with the fact that the environmental impact of bar soap is dismal compared to most liquid soaps. One investigation found that its carbon footprint is 25 percent lower on average than liquid soaps. Liquid soap’s plastic packaging is a huge problem (Americans now cycle through roughly 270 million liquid soap bottles every year) but it’s also what’s inside that causes problems. Liquid soaps usually weigh more and therefore take more energy to transport, plus it’s easier to cycle through it quickly, leading you back to the store again and again for a new bottle. While there are certainly brands out there making clean, natural liquid soaps, there are also plenty that are not. 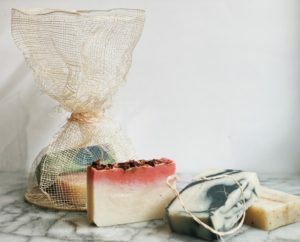 Since bar soap is usually made by combining fats, oils, and water, it typically leaves less room for added chemicals than the liquid stuff—which can be packed with surfactants, synthetics, parabens, and preservatives to maintain shelf life. You will see that all of our soaps are made with 100% essential oils and food grade, plant based fats and oils. While there’s a common misconception that reusing bar soap spreads germs, this, too, has largely been proved untrue. It was found that bar soap covered in bacteria didn’t leave any on the hands of its users after washing. Lastly, many of the conventional soaps are drying to the skin due to the plethora of synthetic chemicals used to increase the company’s bottom line… time and time again our customers rave how long-lasting and nourishing our beautiful bars are. I invite you to get back in touch with bar soap, you’re bound to be surprised and keep coming back for more.